Maria Alpass was baptised on 22nd April 1827 the daughter of John Parslow, gentleman and maltster and his wife, Maria, both of Berkeley. She married Stephen Alpass in Berkeley Church on 16 October 1845. Stephen was a butcher born in Morton in 1812, the son of John Alpass, a yeoman and his wife, Mary. Stephen’s butcher’s shop was in High Street, Berkeley. By 1851, Stephen, Maria and their four children had moved to Canonbury Street in Berkeley where he continued with a butcher’s shop. They were still there in 1861 by which time they had seven children and Stephen had added farming 29 acres to his role as a butcher. Their children were: Stephen John Parslow Alpass baptised 20th September 1846, Maria baptised on 10th October 1847 and who died aged 8 and was buried on 3rd October 1855, Ellen baptised on 4th February 1849, Emily baptised on 29th May 1850, Elizabeth baptised on 29th August 1851, Clara baptised on 20th September 1854 and who died aged 1 year 8 months and was buried on 11th September 1855, Maria and Clara both baptised on 27th January 1858 and Lillie and Ella both baptised on 24th June 1868 after the family had moved to Elberton. The 1871 census shows the family had moved to Elberton where they had a large farm of 253 acres employing six men and two boys. Some of their children had moved away, but they still had seven children with the birth of three more children since Stephen had turned 50! In the 1881 census, the name of the farm where the Alpass family lived was shown as Camp Farm. It was described then as a farm of 250 acres employing three men and one boy. It is not clear whether this a different farm or the same one described slightly differently. Stephen Alpass died in 1883 aged 71 years. He was buried in Berkeley Cemetery in the same plot as his wife’s parents. The probate record shows that his estate was proved by his son Milton on 21st May and the estate was valued at £1,528 4s 7d. By the 1891 census, Maria had moved to a house on Olveston Green with the two unmarried daughters, Ellen and Annie and an unmarried son, Milton who was a farmer. Staying with them at the time of the census was her married daughter now Elizabeth Goulstone and Elizabeth’s young son, Charles aged four. The 1899 rate book shows Maria was renting 81 High Street possibly with her recently widowed sister-in-law, Emma Alpass who was living in that house in the 1901 census by which time Maria and her unmarried daughters had moved to 18 Gloucester Road. The 1901 census shows the family at the house at what is now 18 Gloucester Road in Thornbury. The widowed Maria Alpass then aged 74 and born in Berkeley was living with two unmarried daughters Annie Alpass aged 38 (born in Elberton) and Ellen Alpass aged 42 and born in Berkeley. Maria died in April 1909 aged 82 years and she was buried in the same plot as her parents and her husband in Berkeley Cemetery. The inscription on her grave includes the words ‘her end was peace’ suggesting that she may have been in poor health for some time, and probably cared for by her three unmarried daughters. One of Maria’s daughters, Clara, died shortly after on May 29th 1909 aged 51 years. She was also buried in Berkeley Cemetery, but in a different plot. Her monumental inscription shows that she died whilst living at Heathview, Thornbury. This was a newly built house further down Gloucester Road, now known as number 15. We believe that Maria had moved with her three unmarried daughters to Heathview when it was built in 1908 or early 1909. The Prewetts Directory shows Mrs Alpass was living there in 1909. It also lists ‘Mrs’ Alpass in Heathview until 1913, but we think this is a mistake. We know that at least one of the unmarried Alpass sisters were livingg here by 1912 as we have been told of a card sent Christmas 1912 from Heathview by one of them, probably Annie Laura. In 1914 ‘Misses’ Alpass were listed as living at Heathview. With Clara dying in 1909, this must relate to Ellen and Annie Laura. Ellen died on 6th January 1917 whilst living in Thornbury and the 1918 Electoral Register lists Annie Laura Alpass as living in Heathview. By 1921 this house is occupied by the Laycock family so Annie Laura must have moved elsewhere, presumably to Stevelands. By 1930 Annie Laura was shown as living with her sister, Ella, now married to Charles Phelps who had been living in the big house at Stevelands, Gloucester Road since their marriage on 5th August 1914. Stevelands had been built by Edmund Cullimore who had married Amy Elizabeth Alpass, a cousin of Ella’s in 1907. Annie Laura continued living there until her death on July 29th 1940 aged 77 years. The family seem to have retained a connection to Gloucester Road – they just gradually moved further down as they rose socially. It is interesting that so many of the daughters of Stephen and Maria were buried in Berkeley, even though they had moved away. There are two separate graves containing the remains of their daughters. These include Ella who had married Charles Phelps and lived with him in Stevelands in Gloucester Road, Lilly who had married Frederick Bishop and had lived with him in Auklands, another large house next door to Stevelands, and Elizabeth wife of Decimus Goulstone who had died in Cardiff. None of the husbands were buried with their wives! Stephen John Parslow Alpass. In the 1861 census he was aged 14 and a scholar. A family tree on the Ancestry website says that he died on 20th June 1913. Apparently he went to new Zealand in 1864 aged only 18. There is a detailed account of his life in New Zealand on the Wairarapa website. Emily Alpass. Emily was baptised on 29th May 1850. In the 1861 census she was aged 11 and living with the family at Berkeley. The 1871 census shows that she was the eldest child then living at home with their parents. We have very little information about Emily Alpass. Maria Alpass. 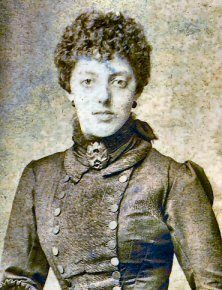 Maria was born on 18th January 1858 in Berkeley. In the 1861 census Maria was aged 5. Maria married Alfred Reis Winter. The 1881 census shows that he was a police constable then aged 28 and that the family lived in Mount Pleasant in Liverpool. They had two children; Emily then aged two and William aged six months. The 1901 census shows that he became a railway police inspector and that they went to live in Garston, now a suburb of Liverpool. Clara Alpass. Clara was baptised on 20th September 1854. In the 1861 census she was living with her family in Berkeley aged three. By 1881 she was living with her parents in Elberton. 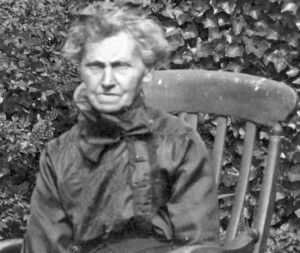 In 1901 she was aged 42 and living in Bootle, just north of Liverpool with her sister Ellen. They were milliners in Stanley Road, a main road to Liverpool. We do not know when she went to live in Heathview in Gloucester Road Thornbury, which is where she died. She was buried in Berkeley with her parents and her sisters. Her memorial inscription says; “In loving memory of Clara Alpass of Heathview Thornbury who passed away May 29 1909 aged 51 years.” Her probate record shows that she left her estate of £381 12s 10d to be administered by her sister Ella. Milton Alpass. By 1891 Milton was living with his mother at The Green in Olveston. At that time he was a farmer. In the 1901 census he was staying with his sister Maria Winter and her family in Wavertree in Liverpool. Family trees on the Ancestry website suggest he may have died in New Zealand in 1944. Annie Laura Alpass. She was born on 5th November 1862 and baptised on 30th September 1863 in Berkeley. In 1891 Annie was living with her mother at Olveston at which time she was 28. The photograph on the right may be of Annie Laura. It was sent in Christmas 1912 to Alpass relations from Heathview in Gloucester Road. This confirms that the Alpass ladies were living in Heathview at that time. By 1930 Annie Laura was shown as living with her sister, Ella, now married to Charles Phelps, in the big house called Stevelands in Gloucester Road. Annie Laura continued living there until her death on July 29th 1940 aged 77 years. Lillie Alpass. She was baptised on June 24th 1868 in Berkeley. 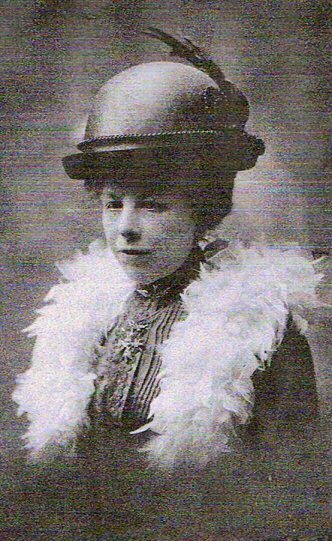 Lily (as she was called in most records) married Frederick James Bishop at the Congregational Chapel in Thornbury on 18th September 1914. Frederick was born on 2nd March 1862. Lily was living at Camp Farm, Elberton at the time of the marriage and Frederick was living at Warmley. The trade directories show that from 1923 they lived in a house called ‘Auklands’ on the Gloucester Road. From about 1930 they lived at “Severn View’ in Gloucester Road. Frederick had a particularly interesting career. He was a “pyrotechnist”. Frederick patented a new type of sparkling firework effect known as “glitter.” Lily Bishop passed away November 9 1937 aged 72 years. Her funeral was held in Thornbury at St Mary’s Church and she was buried in Berkeley Cemetery. Frederick died on 10th September 1958. Ella Alpass. She was baptised 24th June 1868. In 1891 she was a drapers assistant in Paddington in London. On 5th August 1914 she married Charles Phelps. 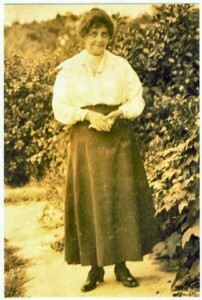 Above on the left we have a photo of Ella Phelps taken in the garden of their home in Thornbury.